You have not experienced great golf holes until you have played the 18th hole at the La Mirada Golf Course in California. This hole is over 360 yards long. It is downhill and the green is extremely small. It is one of the best holes in the country. In 1961, William F. Bell architected this gem that boast 6,083 yards. The course has an impressive 69.2 rating, and the slope from the farthest tees is 117. It goes without saying that all of the tee markers on this course will give golfers a ch hallenging adventure in the beautiful California sun. La Mirada Golf Course tee times do not last long, and these tee times typically cannot be taken overnight. The best way to get the La Mirada tee times that you desire is by planning ahead. Reservations for tee times can be made by calling the pro shop or going online. The course also offers a chipping area and putting green. You can also rent some clubs to play a round with or practice your game at the driving range. 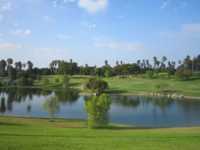 There are also some great La Mirada golf deals that occur throughout the year, so it is best to call the course if you are looking to save a little money while playing this golden golf course.